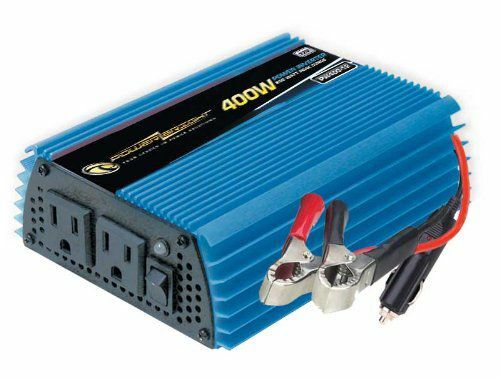 PowerBright PW400-12 400 Watt 12 Volt DC to AC modified wave power inverter.Get Power on the Go! This inverter plugs into your 12 Volt cigarette lighter outlet or connects directly to the battery with supplied alligator clamps to power laptops, cell phone chargers and other small electronic devices in your vehicle or home. Energizer 2000-Watt Power inverter - Get power on the go. This newly redesigned heavy duty power inverter connects directly to a 12-Volt DC battery to power microwaves, power tools, televisions, gaming consoles, home electronics and appliances in your vehicle. This unit also features an LCD display which shows the output wattage or input voltage and battery level. Plus, charge USB devices directly from the 2 USB charging ports 2.4A each (4.8A total) at the same time. With this inverter, you will never be left without power when you need it. 3 ft. Cables Included. 400 Watt 12V DC to 120V AC Power Inverter PowerBright PW400-12 400 Watt 12 Volt DC to AC modified wave power inverter.Get Power on the Go! This inverter plugs into your 12 Volt cigarette lighter outlet or connects directly to the battery with supplied alligator clamps to power laptops, cell phone chargers and other small electronic devices in your vehicle or home. 400 Watt 12V DC to 120V AC Power Inverter is rated 3.8 out of 5 by 5. Rated 5 out of 5 by MightyMoose1 from CPAP Necessity for Power Outage Works great to run cpap when power is out! Easy to use! Rated 5 out of 5 by Dusty from I used an old version of this inverter for years... I used an old version of this inverter for years until I fried it by connecting the output to a live 115 volt circuit by mistake. Tested the new inverter using a 400 watt load and it worked perfectly. Use the inverter for 115 volt power in our cars, travel trailer and during power outages. Rated 1 out of 5 by DCDave from Inverter failed immediately! I got a bad one. I connected the inverter to my car battery for the first time. Then flipped the switch and it started smoking before I turned on my tool. Yes, it was hooked up properly. I disconnected it and packed it up and returned it back to Home Depot. Hope you have better luck with yours. Rated 4 out of 5 by Kozi713 from Great product I bought this inverter for a solar panel I built myself and needed an inverter for AC loads. I believe this is the best bang for the buck for a 400W inverter. It's easy to use and powers my small tools and even an old tv and vcr from a 12V/6AH battery. It would be better if it had a USB connection.